The Satoyama Development Mechanism (SDM) was established in 2013 as an IPSI collaborative activity between the Institute for Global Environmental Strategies (IGES), UNU-IAS and the Ministry of the Environment, Japan, to promote activities in line with the IPSI Strategy and Plan of Action through the provision of seed funding to promising projects proposed by IPSI members. Six projects have been selected every year, and each year a booklet is published containing updates on ongoing projects, reports from completed projects, and announcements of newly selected projects. 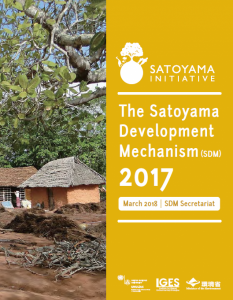 The booklets contain a great deal of useful information on implementation of projects for SEPLS management, and should be very interesting for anyone involved with the Satoyama Initiative. The booklet for SDM 2017 is now available for download here.